This portrait of John Long is a treasured item at the Wayne County Historical Society. 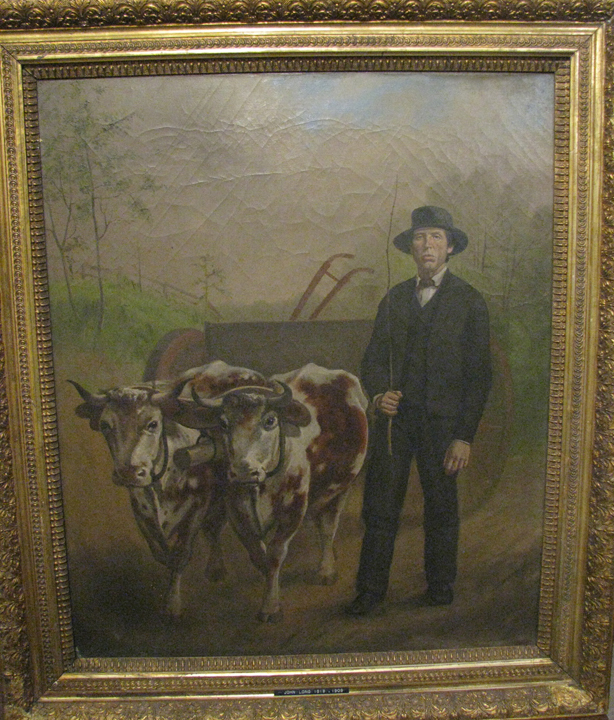 Painted by Wooster artist, Charles Gasche, it shows Mr. Long walking alongside his oxen and wagon. The painting was gifted by descendants Wallace Smith and Elizabeth Smith Dingman. According to records, John Long was born September 12, 1819 and married in 1852. He died August 2, 1909. We’re indebted to the family for sharing their prized heirloom so long ago for others to enjoy today. The artist, Charles Gasche, was born in Wooster, Ohio in 1846 or 1847 and became a well-known fresco artist. Later, working for the Caldwell publishing firm from 1873-1875 as a “sketcher”, his meticulous drawings of local landmarks and farm scenes were published in the 1873 Caldwell’s Atlas of Wayne County and of the City of Wooster Ohio. In 1876, Charles Gasche began painting elaborate “pictorial decoration” on the interior of the Quinby Opera House in Wooster. It was completed the following year. Gasche’s sketches can also be found in the Ashland County and Holmes County atlases. This Gasche portrait of John Long is one of several belonging to the Wayne County Historical Society. The artist died in 1895. I believe you have the wrong death date for Charles Gasche. Charles Gasche, the well-known artist, departed this life last Saturday morning, July 3d, at his hhome on North Buckeye Street. For a considerable period he had been an invalid from consumption of the lungs, which finally caused his death at the age of 39 years, 7 months, and 17 days. He was the oldest and only surviving of three sons of the late Captain Gasche, his bereaved mother being now the only living member of the family. On Oct. 12th 1869, he was married to Miss Mary Young, oldest daughter of the late Louis Young Sr., which union was favored with two sons, the eldest, Paul, dying in April 1882. The deceased was an artist of much natural ability and of finely cultivated skill. Much of his excellent work lives here at home and specimens at many places abroad will keep his name and ability in memory. The elaborate oil fresco painting in the Court Room, with its portraits of the Judges, are evidences of his skill, as is also much of the painted ornamentation of Quimby Opera House. In many residences are samples of his skill, by way of beautiful decorations; also portraits, pieces of natural scenery and animals, fruits and flowers, gems of fancy sketches etc. He gave instruction in the art and was a popular teacher. Socially, he was clever, liberal and companionable, well informed on all topics, a fine conversationalist, and popular with acquaintances. Many much reqret his death in the prime of life. The bereaved with and mother have the sympathy of all. The funeral took place Monday afternoon and was largely attended. Services were conducted by Rev. Heindel and Rev. Fetzer. The following were pall bearers: M/S. Nachtrieb, W.K. McCalmon, Jacob Mougey, John F. Reamer, George Faver, Emil Podlich. The remains were sadly interred in the grave in Wooster cemetery. Thank you for your research! I need to start referencing my sources. I don’t remember from where I got my information. I’ll have to do some digging! I have more info on him and others in the family, if you need it. Contact me at: my email and let me know what you need.